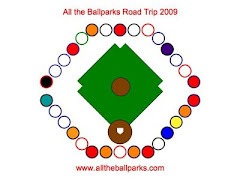 After the Detroit Tigers game on June 20, 2009, we drove by the ballpark they used before moving into the current park. Not much is left of Tiger Stadium, as they began the final demolition earlier this month, but there still was a good chunk of it left to see and photograph. It certainly is not the best way to have seen it, but it is better than missing it entirely, since it is supposed to be entirely gone by the end of this month.